Squash, along with corn and beans (the three sisters), are believed to have originated in Mexico and Central America where they have eaten 7,500 years ago. Native Americans shared many varieties of squash with the European settlers, who took the seeds back to their countries. Today, squash and pumpkins are grown all over the world and are wildly popular in many Eastern European countries. A fruit is defined as the part of the plant that contains seeds. So a pumpkin is definitely a fruit. Pumpkins are considered a member of the gourd family, which includes watermelon, muskmelon and summer and winter squash. Pumpkin is a winter squash that, despite its name, is a warm-weather crop. It gets its moniker because it can be stored through the winter. 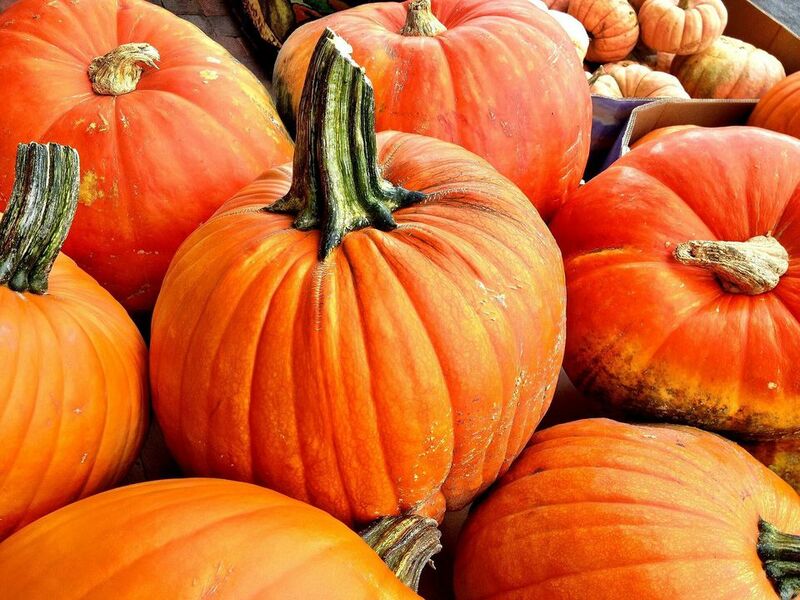 Pumpkins come in a variety of colors: green, yellow, red, white, blue, multicolored and more. They can be tiny, squat, tall, short, round, pear-shaped and some so big they take a forklift to move. Some are better for carving, some are better for eating and some are better for display. An average-size pumpkin contains about 1 cup of seeds that can be salted and dried or toasted to be used in bread and baked goods or eaten out of hand as a snack. Native Americans ate pumpkin flesh roasted, baked, boiled and dried. They ate the seeds and used them as medicine. The blossoms were added to stews, and dried pumpkin was stored for winter use or ground into flour. They dried the shells and used them as bowls and storage containers. The dessert the Pilgrims and Native Americans enjoyed at the early Thanksgiving celebrations was not pumpkin pie (it didn't show up for another 50 years or longer). It was pumpkin custard made with a pumpkin whose top had been lopped off, seeds scooped out and filled with cream, honey, eggs and spices. The pumpkin top was placed back on, and the whole shebang was buried in the hot ashes of a cooking fire and baked. Servings of custard and cooked pumpkin made the rounds. The Pilgrims were known to make pumpkin beer by fermenting persimmons, hops, maple sugar and pumpkin. Early jack-o'-lanterns were carved from turnips and potatoes by the Irish and Scottish and carried in pagan Celtic celebrations, while the English did the same with beets. Lumps of coal were lit on fire and placed inside the hollowed-out root vegetables. When European settlers arrived in America, they continued the tradition with pumpkins. Nearly every part of the pumpkin can be eaten. The cooked pulp is fabulous in pies, cookies, bread, soups, appetizers, main dishes, beverages and more. Like zucchini blossoms, pumpkin blossoms are excellent stuffed, breaded and fried or used as a wrap. The seeds—raw, dried or toasted—make a great snack. Depending upon the variety, pumpkins and winter squash have different culinary uses. Sweet and refined varieties are best for pies, while dry and dense varieties are well suited for soups and stews. Look for soft spots or open cuts that would indicate damage or early spoilage. Don't worry about cosmetic blemishes or surface insect damage. They won't affect the taste. The best pumpkins for baking are Cinderella, Pink Banana Squash and Sugar Pie varieties. A 5-pound pumpkin will make about two 9-inch pies. You can cook a jack-o'-lantern type pumpkin, but the flesh will be watery and stringy, and your end product won't be as tasty. Jack-o'-lantern pumpkins were bred to have upright straight walls, to be hollow, and to stand up to being carved. They were not bred for eating. In a large saucepan with approximately 1 inch of water, add 2 pounds of chopped pumpkin pieces (the larger the chunks, the longer it takes to cook). Bring to a boil, cover, reduce heat, and let simmer, stirring occasionally. Larger pieces take between 20-25 minutes to cook, smaller pieces take 10-15 minutes. Cook until the flesh can be pierced easily with a fork. When dicing pumpkin, it's easiest to remove the skin first with a potato peeler. If cooking large chunks, just leave the skin on and peel it off after it's cooked. Drain and cool or use as your recipe directs. Fill a large covered saucepan with 1 inch of water. Place a steaming rack inside. Add pumpkin pieces, cover, and bring to a boil. Reduce heat and steam for 30 minutes (or until tender). Remove flesh from skin once the pumpkin has been drained and cooled, or use as your recipe directs. Or you can also steam pumpkins in a rice cooker. Heat the oven to 350 F. Cut a pumpkin in half crosswise and scoop out the seeds and stringy material. Cover the cut side of each pumpkin half with a piece of foil. Place the pumpkin halves, foil-side up, on a baking sheet and bake for about 1 1/2 hours or until the flesh is very tender when pierced with a fork. Don't worry if the edges are browned. The natural sugars actually caramelize and give it a richer, more complex flavor. When it is cool enough to handle, scoop out the flesh. Once the cooked pumpkin flesh has been removed, mash it with a fork or potato masher, or purée with a food processor or blender until smooth. Then measure out the amount you need. A 5-pound pumpkin will yield approximately 4 cups of mashed, cooked pumpkin pulp. A 29-ounce can of pumpkin is equal to about 3 1/4 cups fresh, cooked, and puréed pumpkin. A 16-ounce can of pumpkin is the equivalent of approximately 2 cups of mashed pulp. If your pumpkin pulp is too watery, you may drain it in cheesecloth or a sieve. Alternatively, you can cook it down to a thicker consistency in a saucepan. Don't count out cooked pumpkin as a nutritious baby food. Pumpkin pulp is a good candidate for freezing. Place pumpkin pulp in zip-top freezer bags in whatever proportion most of your recipes call for (1/2 cup, 1 cup, 2 cups, etc.). Flatten the closed bag like a slice of bread and label with the date and amount. It will keep for several months with no loss in flavor or quality. When you are ready to use it, take it out of the freezer, and place it in the refrigerator to thaw. After you have carved your pumpkin, use your fingertips, dipped in petroleum jelly or vegetable oil, to coat the cut edges of your jack-o'-lantern. If the design is intricate, you can use a cotton swab. During the day, keep your pumpkin out of the direct sun. If you have room in your refrigerator, place your pumpkin in it overnight. Place your pumpkin in a bucket of water overnight. Add 1 teaspoon of bleach to a bucket of water and dip your pumpkin in it to inhibit mold growth. If you aren't going to eat your pumpkin, some folks have had some success with hairspray or clear acrylic spray. The idea is to seal the flesh so it will not have moisture loss. Use caution when using white glue. Glue can actually feed the mold spores. Painted pumpkins can last for months because the flesh is not pierced. You'll be able to enjoy them for the whole fall season. It's inexpensive, easy and a fun family project. You can either freehand draw the face directly on the pumpkin with a colored marker. Or you can draw the pattern you want on a piece of paper (or photocopy an existing pattern) and then with gentle pressure, trace the outlines on the pattern with a soft pencil or stylus to inscribe the design. Then color with a marker. Another way to make your masterpiece last even longer is to carve or paint a gourd and not a pumpkin at all! You can grow a pumpkin from one of the seeds you've harvested but it might not look like the pumpkin it came from. There's a good likelihood your pumpkin will be a cross of the different varieties grown on the farm it came from. Also, when you plant a seed from a hybrid, they can revert back to their parentage which may have undesirable traits. Still, it's fun to watch them grow.